Designing the Cord-Fix box has meant mockups and package origami! 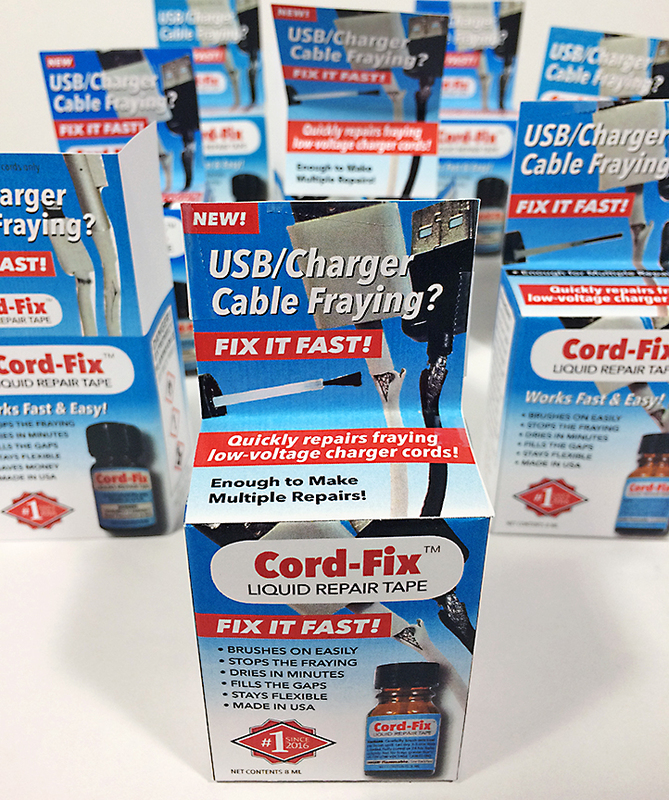 The retail package for Cord-Fix has been my current obsession. Perhaps overly so, as I am now on version 4.7c. I do tend to get carried away when I find a challenging design project! As you can see, I’ve changed the artwork considerably, and tweaked the text. I’m fortunate in that I am an experienced copy writer, ad mockup designer, and a photographer. That gives me the ability to create press-ready designs without hiring and ad agency. Plus it’s super fun doing it all myself! It’s a small box, so getting both images and copy to fit has taken some effort. But this is my favorite version so far. I’ve reshot the bottle using the update label. I’ve added new images of frayed USB cables. I’ve placed the images to follow the contours of the box, taking advantage of the dimensionality of the package to help the images “pop” off the box. The copy is all about the advantages of using Cord-Fix to repair frayed charger cords and USB cables. The headline on the hang tab is a call-out question, designed to alert consumers that there is indeed an alternative to constantly throwing away frayed cables and buying new cords. Is this the final box design for our official launch? Mmm, probably not. I have a few more ideas to try. But this is getting close to completion and release. Copyright © 2019 Cord-Fix, Inc.